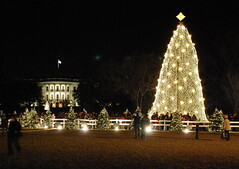 Today is the National Christmas Tree lighting that takes place on the Ellipse. It starts about 5pm, and there will be altered traffic patterns around the area, and the whole thing turns downtown DC traffic to so much crap. So, if you’re reading this at the office, start to wrap things up and get the hell out of there, lest you be stuck in it. Or, if you can’t do that, it may be time to shelter-in-place at your favorite watering hole with a tasty winter drink. Avoid the fustercluck downtown.